Pork Tocino, an all time favorite of most Filipinos. A cured meat product native to the Philippines. It is usually made out of pork and is similar to ham and bacon. It is traditionally boiled in water (just enough water to cover the meat) or fried in oil, or is cooked over medium heat until the fat is rendered. 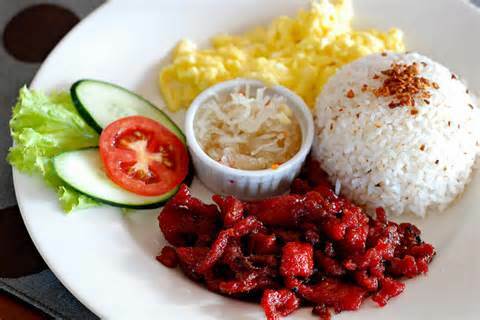 In Philippines, Tocino is usually served with Sinangag and Pritong Itlog, Filipinos used to call this combination as Tocilog and it is best when eaten during breakfast time. Try it for lunch and dinner as well – with eggs and sinangag, or atsara and suka, or even as sandwich filling. So delicious, you'll keep coming back for more! If you don't have time, you can buy a Pampanga's Best Tocino from a local supermarket or wet market to save you from lengthy preparation. 1. First, mix all ingredients together in a large container with a lid. Adjust coloring as desired. 2. Allow to stand in the refrigerator for at least 1-2 days to allow flavors to permeate meat. It can also be stored in the freezer for later use. 3. Place in a wide and deep skillet with around two cups of water. Simmer until meat is tender and water has evaporated. 4. Add 2 to 3 tbsps oil and continue to cook until meat has caramelized, moving in pan regularly to prevent from burning. 5. Arrange your plate with Sinangag first, then put Fried Egg on side and tapa pieces next to it.